All transactions are safe and secure with a reliable history in online purchasing behind each of our associates. Buy the Hey, Jerk! Speed Kills! t-shirt to own Halloween clothing and merchandise. 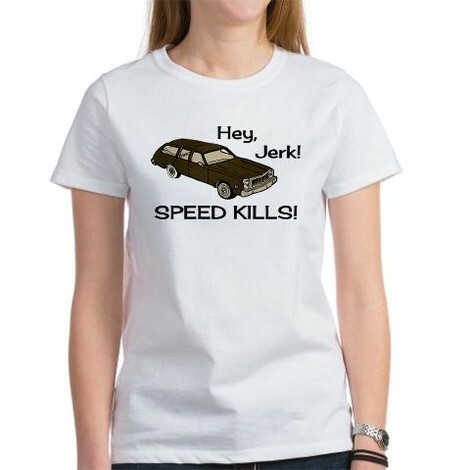 The fronts of these Halloween movie t-shirts display the classic line by Annie Brackett (Nancy Kyes), "Hey, jerk! Speed kills!" Annie, the daughter of the Sheriff, delivers this Halloween movie quote when she, Laurie Strode, and Lynda van der Klok are walking home from school. Michael Myers' car cruises by the girls. Annie yells, "Hey, jerk! Speed kills!" The car screeches to a halt, and Annie says, "God, can't he take a joke?" Laurie playfully warns Annie, "You know Annie some day you're going to get us all in deep trouble." Also available in tan. In addition to the Hey, Jerk! Speed Kills! tee above, browse the Halloween Clothing Gallery for more apparel like men's and women's clothes, kids shirts or hoodies.